We've two types of really simple, yet really sophisticated chord charts for some of our backing tracks. The first are "Super Chord Charts" and the second (a new product range) are "EveryKey Chord Charts". We've addressed all those questions in our "Super Chord Charts". You can download an interactive sample here. Run your mouseover the chart to have the different areas explained. 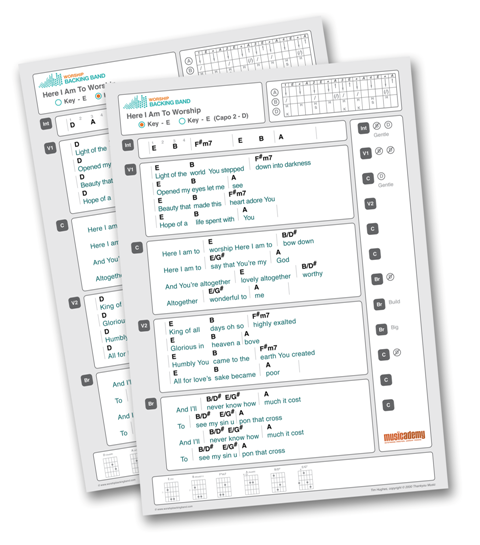 Buy 10 or more chord charts (either type - you can mix and match) and get a 20% discount.